New apartments with up to 2 bedrooms for up to 5 people. FEWOTRAUM - MÜRITZ is your new holiday home on the Müritz. The detached building has been completely rebuilt according to the latest and most comfortable stand. 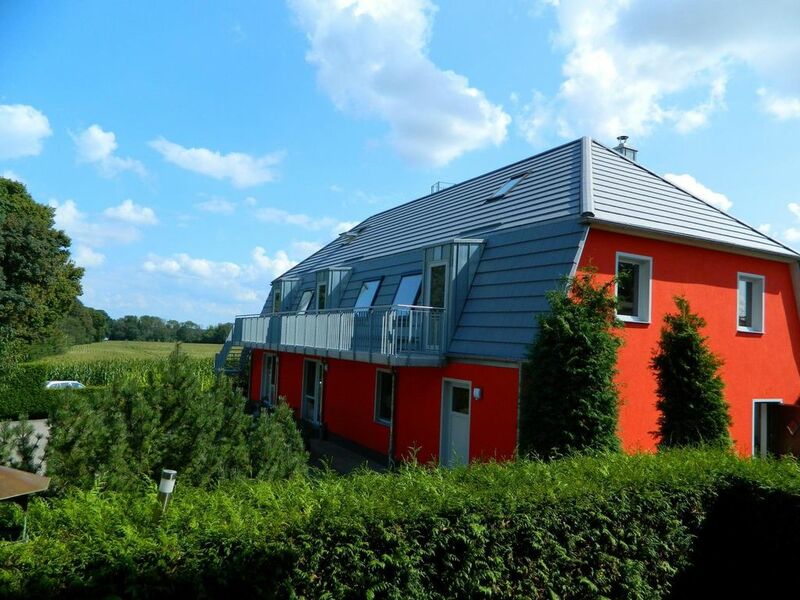 The apartments are located in Mecklenburg-Western Pomerania, Mecklenburg Lake district, on the beautiful and quiet outskirts "Marienfelde" the small idyllic town Röbel / Müritz. To Müritz (Germany's largest lake) is about 400 m.
Between the holiday home and the Müritz is a field with adjacent meadow, which connects directly to the water. The path leads to the asphalted "Müritz-, Rad- und Wanderweg" along a beautiful tree-lined avenue. All around our holiday home you will find many opportunities to relax and enjoy a relaxing holiday on the Müritz. The apartment 'MÖWE 1' is located on the ground floor. These can be reached to the flat earth via four small steps. The apartment is equipped for up to 3 people. Size approx. 50 m² with one bedroom each (2 persons) and a comfortable extra bed in the living area (for 1 additional person possible). Living / dining room: SAT-FULL HD TV, radio, Internet WLAN, 1 bedroom double bed, 1 comfortable sofa bed (with extra bed for sleeping), kitchenette, 4-zone ceramic hob with oven, refrigerator with freezer, dishwasher, coffee machine, kettle, toaster and sufficient dishes, bath with shower / WC, terrace, garden furniture, barbecue area, car parking space. Non smoking. Covered seating Outside invite you to have breakfast, relax and / or a barbecue. The apartment 'MÖWE 1' is located on the ground floor. These can be reached to the flat earth via four small steps. The apartment is equipped for up to 3 people. Size approx. 50 m² with one bedroom each (2 persons) and a comfortable extra bed in the living area (for 1 additional person possible). Living / dining room: satellite TV, radio, Internet, 1 bedroom double bed, 1 comfortable sofa bed (with extra bed for sleeping), kitchenette, 4-zone ceramic hob with oven, fridge freezer, dishwasher, coffee maker, kettle, toaster and dishes , Bathroom with shower / WC, terrace, garden furniture, barbecue area, car parking space. Non smoking. Covered seating Outside invite you to have breakfast, relax and / or a barbecue. Wir haben uns gut erholt, haben genau das vorgefunden, was wir erwartet haben. Aufgrund des schlechten Wetters, haben wir viel Zeit in der Wohnung verbracht. Man konnte es gut aushalten. eine Bestätigung dafür, das auch der Herbst an der Müritz in unserem Feriendomizil seine Reize hat. sehr herzlich empfangen und haben uns sehr wohl gefühlt. Es war ein rundum gelungener und erholsamer Urlaub. es freut uns sehr, das Sie sich bei uns sehr wohl gefühlt haben. Wir haben Sie als sehr nette Gäste in Erinnerung und wünschen Ihnen für die Zukunft alles Gute. Ein wunderschönes Haus in einer sehr schönen Lage. Die Familie Gromodka hat auch die Inneneinrichtung sehr schön gestaltet und qualitativ hochwertig ausgestattet. Wir kommen gerne noch einmal zu Ihnen. Alles Gute für Sie und schöne Grüße, Familie Gromodka. Wir haben eine sehr komfortable und saubere Ferienwohnung vorgefunden. Sehr nette Vermieter ...wir kommen gerne wieder. Super Ferienwohnung in schöner Landschaft. Waren selten nach kurzer Zeit so gut erholt. Das Ferienwohnung bietet alles was man sich wünscht für einen komfortablen, erholsamen Urlaub. Dieses angenehme Feriendomizil werden wir mit gutem Gewissen weiterempfehlen. Wir genossen die gute Ausstattung, die Möblierung im Innen-und Außenbereich und die überdachte Terrasse als Wohlfühloase. Die Aussicht und die Lage ist hervorragend. Von Ort aus kann man die Umgebung sowohl mit den Rad und zu Fuß als auch mit dem Auto erkunden. Selbst bei dieser Jahreszeit hat die Umgebung Ihre Reize. Directly on the property leads the "Müritz, - bike and hiking trail" along. This is paved and goes around the entire Müritz. It is connected to the international cycle path "Berlin - Copenhagen". To Müritz (Germany's largest lake) is about 400 m. To the beach with sunbathing area it is about 300 m directly along the shore, the center of Röbel is about 1.5 km away (there is also the Müritz-Therme). Nowhere else are beaches, forests and water as close together as in Röbel / Müritz. In addition to summery beach and bathing pleasures, you can expect well-developed cycling, riding and hiking trails, boat trips, extensive sports facilities and a wide range of culinary delights. Exclusive holiday accommodations in the quiet recreational area "Marienfelde" are available at any time of year on our idyllic and well maintained grounds. Especially nature lovers, hikers, water sports fans, swimmers and cyclists will get their money's worth here. You will be offered a wealth of holiday activities. For our holiday home there is the possibility to rent apartments alone or with friends and acquaintances, without having to give up all the amenities of their own apartment. You will be amazed by the tasteful decor with modern kitchen. By central heating also well equipped for autumn and winter. We do not offer meals, but there is the possibility for self-catering with everything you need. If you do not feel like cooking, you can of course use the hospitality of the local restaurants. In the small town of Röbel / Müritz live about 5400 people. The small town belongs to the district Mecklenburg Lake District. It lies at an altitude of 65 m above sea level, on the west bank of the Müritz. The cityscape of Röbel / Müritz changed a lot for the better after the political change (1991). The city center and the town hall were thoroughly renovated. Many half-timbered houses now shine with new colors and invite you to take a look. The Röbeler city harbor with its small souvenir shops and dining facilities should definitely visit. The various shipping companies offer many trips to the adjacent lakes and canals of the Müritz. The largest contiguous lake landscape in Europe is located in Mecklenburg Vorpommern. In total there are 2033 lakes with a total area of 738 km². The Müritz ("Small Sea") is the largest lake in Germany with an area of 117 km ². Around the Müritz leads the "Müritz cycle path". At this are many small and middle towns. Such as Röbel / Müritz, Rechlin, Boek, Mirow, Waren, Klink, Sietow, ... The Mecklenburg Lake District is a paradise for water walkers. There are many different providers to explore lakes and canals. How about a canoe, raft, houseboat, motor yacht or just a pleasure in sailing, surfing, diving or water skiing? Then you are right with us at the Müritz. The largest national park in Germany is the Müritz National Park (300 km²). This is located only on the mainland. The Müritz National Park consists of two sections, the Müritz and the area around Serrahn (near Neustrelitz). The area on the Müritz is characterized by its unique moorland and pine forests. Serrahn is characterized by the unique beech forests. Fantastic are the many, many lakes (over 100) and the untouched nature in both areas. Therefore, the name "land of the 1000 lakes" was created and justified. The Müritz National Park is one of the typical ice age landscape Mecklenburg. Many endangered species of animals and plants have found a home in the Müritz National Park. Here they have a lot of peace and space to be able to live a species-appropriate life, such as: the white-tailed eagle, the red deer, the cranes, the moor frogs, the bittern, ... Particularly noteworthy in autumn is the rest of the cranes. The plants such as cottongrass and Greiskraut are already very common because of the unique moor landscape. The nature conservation in the national park is "capitalized". Nature is left in "peace" so that it can unfold and develop undisturbed. Only guided tours and the use of the bike and hiking trails allow you to see this fantastic and unique landscape.